Add a hands-on experience to your unit on the skeleton system by having students measure the length of their own femur and their height. Students calculate the height of unknowns using a formula that has been established in forensic science. The goal is to solve a “mystery” where several bones were found at a construction site. Students must use the data to determine how many different bodies were present at the site and their heights. Students will need tape measures or meter sticks to measure their own femurs. 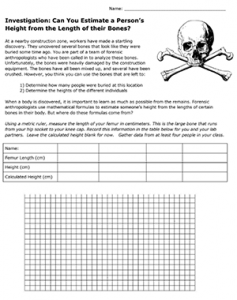 This activity was modified from a forensics activity, mainly shortened so that students can complete it in a single activity. It is intended to be completed after students have obtained a basic understanding of the skeletal system. Instructions have been reduced as it is expected that students will know the location of the bones they are investigating.